Magis’ Piña collection was designed by Spanish Jaime Hayón, who is known for his unique, playful designs. The range includes comfortable chairs and tables for both indoor and outdoor use – the cataphoretically treated frame is perfect for gardens, balconies and terraces, whereas the untreated frame and wooden legs are more suitable for indoor lounging. The user’s weight presses the cushions against the chairs’ woven metal frame and creates a fun visual effect of pinecone or classic capitonné upholstery. As for the tables, the slender frame brings a pleasant sense of airiness. Create an inviting sitting area with Piña! Jaime Hayón (b. 1974) grew up in Madrid where he got influenced by the local culture of skateboarding and graffiti painting. He studied industrial design in Madrid and later on in Paris. In 2000 he founded his own studio where and since then he has developed to a acknowledged designer. His works have been noted globally in distinguished medias. 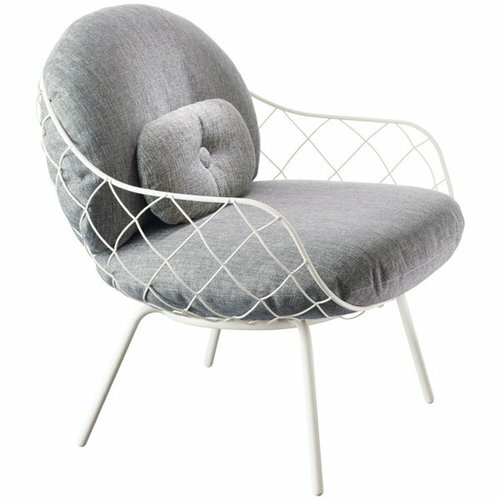 Hayón has worked for several companies including Magis, &Tradition, Fritz Hansen and Swarovski. Today Hayón has offices in Italy as well as in Spain and Japan.